I'm sure many of you would like to hunt different animals. By installing Hunting addon you can do this with a hunting rifle and a special suit. Deers, buffalo, bears, rabbits, and other animals from real life can be your prey. There are a rifle and ammunition for it, which has the characteristic sounds of shots and realistic appearance. Also, the author added the fishing for those who like to spend time with a fishing rod in hands. There are several kinds of fish with modified textures. So grab a fishing rod and start fishing. Hunting addon also includes hunting suit. Thanks to it you can camouflage yourself in the woods and wait for your target carefully. In order not to search for a suitable map for the game, the author initially added the most appropriate one for the full hunting. You will spawn in the forest, where you need to take a gun and put a suit. Then you can start hunting. 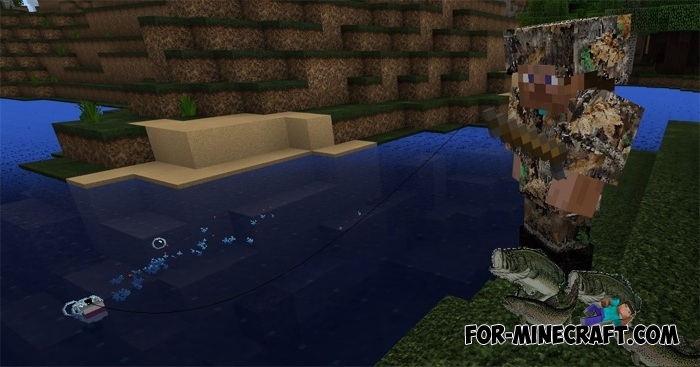 Send this addon to your friend and you will be able to arrange a hunting together. How to install the Hunting addon? Download the archive and extract all the files. Install behavior and resource pack (activate these files in the world settings). Then copy the map here - /games/com.mojang/minecraftWorlds. More Bears mod for Minecraft PE 1.0/0.17.0More Bears mod adds 4 new types of bears to the game but that's not all..